Dianne Harman's books have kept me turning pages since my introduction to her writing when I read Blue Coyote Motel. I had finished reading that particular series and was ready for more. Along came her Cedar Bay Cozy Mysteries and, after reading Kelly's Koffee Shop, I went on to read the remaining three books in the series, or so I thought. In the process of preparing to share my thoughts about her cozy mysteries, I learned there are three additional titles published in the series; I hope to read those in the near future. Kelly's Koffee Shop introduced me to Kelly, Rebel and Mike. Kelly owns a coffee shop which serves breakfast and lunch to the locals. Her days begin early in the morning with her boxer, Rebel, accompanying her as she goes about her work each day. He even has his own spot in the coffee shop. Mike is the town sheriff, a good friend of Kelly's, who often stops by the coffee shop for his own meals. Imagine his surprise when he learned one of Kelly's staff members, Amber, went missing! Later, her body was found and there was evidence of foul play. The investigation into her murder began. According to everyone who knew her, she was a model child and student who had high hopes for her future - but was everything as it seemed, or would the investigation reveal a surprise almost too hard for some to accept? I thoroughly enjoyed this story and it was a delight when I got to the end of the book to find a few recipes for some of the foods mentioned in the story. I've tried one recipe so far which my kids and I enjoyed. 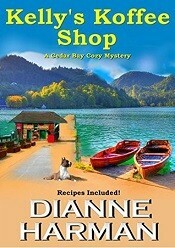 If you would like to read the first installment of Dianne Harman's Cedar Bay Cozy Mysteries, you can find more information about it at Amazon. 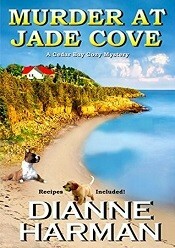 Murder at Jade Cove is another page-turner written by Dianne Harman. In this story, one of the characters - a prominent rich member of the town - is murdered. As Mike's investigation progresses, he learns there are many people who had a motive for wanting this person dead. Of course, though busy with her coffee shop, Kelly is never too busy to try solving the crime, many times not even sharing with Mike (now her fiance) about what she is up to until after the fact. In Murder at Jade Cove, Kelly comes too close to being in harm's way when she is snooping around. Someone has something to protect, but who is it and to what extent will he/she go to keep the truth from being discovered? Dianne Harman has done it again: this book kept me guessing, turning pages late into the night. If you would like to learn more about the title, don't hesitate to pay a visit to Amazon. 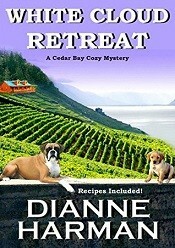 Kelly and Mike are back in action with White Cloud Retreat, the third installment of the Cedar Bay Cozy Mystery series. In this book, you will get to know a little about a Buddhist Zen Master, but will get to know more about him after he is murdered. There were several people who might have been found guilty, some of the suspects being close to home. The story kept me glued to its pages and I got to meet a few more people in and around Cedar Bay. One of the things I enjoyed most about this story was that, even though it was centered around a Buddhist retreat center, the story never once tried to push the Buddhist belief system on me. Having grown up with a Christian background, this was an important element of the story. White Cloud Retreat seemed to hold more suspense within its pages and surprised me a few times. I would definitely recommend it to anyone who enjoys a good mystery and you can find it at Amazon. 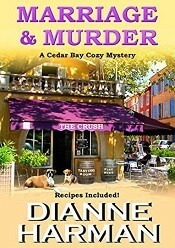 Marriage & Murder is the fourth installment of Dianne Harman's Cedar Bay Cozy Mystery series. You don't have to read the books in the order they were written to enjoy the series but, if you want to read about events as they happened, begin with the first book. Only then will it mean something when I tell you that Kelly and Mike, finally, get married. However, their honeymoon is cut short when another resident of their town is murdered. Many of the citizens have their own suspicions and some are adamant about expressing those opinions. I was in for another roller coaster ride as I learned more about the residents of Cedar Bay and some of the secrets it held. This quiet, peaceful town had lost more than a little of its charm since four of its residents had been murdered within a short period of each other, especially when you consider that one murder may have taken place in the distant past. I look forward to reading the remaining three books in the series and, hopefully, by the time I finish reading them - since there are other books I plan to read between now and then - there may be additional titles published. To learn more about Marriage & Murder, be sure to visit its page on Amazon. You'll want to curl up in a cozy room and, if you're like me, you won't want to stop reading until the last page has been read.